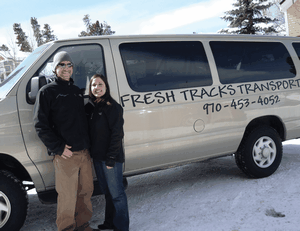 In addition to the services listed above, Fresh Tracks provides shuttle service for any event, function or outing in Summit & Eagle Counties including Breckenridge, Keystone, Vail, Beaver Creek, Copper Mountain, Arapahoe Basin, Frisco, Silverthorne & Dillon. We also provide shuttle service to Denver for any sporting event or concert. Contact us today for rates & availability.